What could be better than relaxing by a pool on a beautiful day? How about relaxing by a pool on a beautiful day with a gorgeous lake view? That is the setting for a stamped concrete project completed by the Will’s Concrete Concepts team of Kansas City,Missouri. This stamped concrete pool surround overlooks Lake Lotawana in Missouri. This residential project covered an area of 2,000 square feet and took 3 days to complete after the initial set-up and pour. 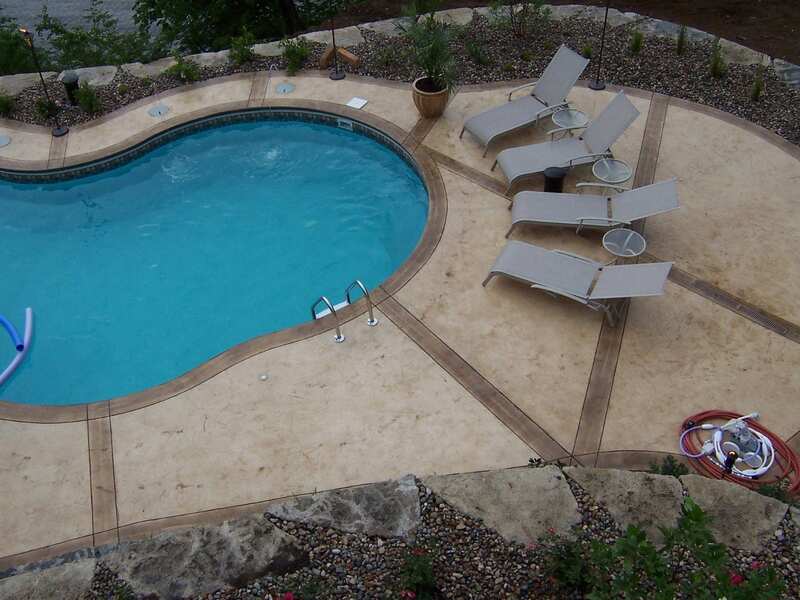 Willie Brownsberger and his team chose to use products from SureCrete Design Products to complete this job. Almond Color Hardener was broadcast over the fresh pour of cement for a base color. A slate skin textured mat was used for a seamless and continuous look. Their job was made easier by using Powder Release in Limestone, which aids in the release of the mat from the cement. In this case, the Limestone colored Powder Release was chosen so as NOT to add much additional color. The control joints were cut in an appealing style that added a striking contrast to the free form surround. Along with the control joints, the saw-cut border around the pool was stained with Espresso colored Eco-Stain to accent the area. No outdoor project would be complete without being sealed. Willie chose HS-260 Acrylic Concrete Sealer to provide a high performance waterproof finish. The advanced nano technology used in this sealer makes it an outstanding choice for outdoor use in extreme climates. It is sure to hold up to pool water, the summer heat, and winter’s cold.